National Music Week is coming soon and music teachers are some of my favorite people. I taught K-8 music so I know the challenges they face. About this time in the year, music teachers begin to droop from late night musical rehearsals, competitions and performances. I think its great news that there are several tools to train the 4 different areas of the Common Core Standards. Music is a gateway to learning anything. It is an essential and not an extra to add to the the curriculum. Music is an important global language that can produce the kind of collaboration that makes our world blossom. I recently read an article posted on the Roland Music Education site entitled, How Common Core Standards Affects Music in Education, and saw a definite correlation between Gynzy’s new tools and the standards that encourage critical thinking in these four core areas: reading, writing, speaking and listening. Here is a new lesson that will have all your students reading and understanding the duration of notes and rests. There are some great music clips in all styles with which your students can clap along. 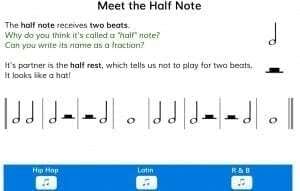 You can use the fraction tool within the lesson to teach why a whole note gets four beats and a quarter note gets one beat for that deeper level of understanding that might even help them with their math. The best tool yet for music teachers to teach listening is the revolutionary new sound tool which uses several different sounds to demonstrate how pitch changes. My favorite sound is the sax, but there are several to choose from. I can put my finger on the white board and hear an e and as I scoot my finger up, the pitch changes to an f. You can also show the difference in loud and soft dynamics with the customizable settings. 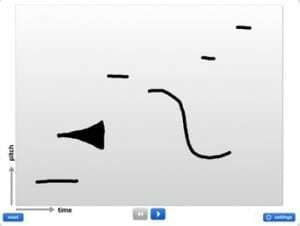 You could also use this tool to do ear training in class and let students choose the intervals with the touch of a finger. The Anchor Standards now call for students to “interpret words and phrases as they are used in text.” So music also opens up the world of language arts. Gynzy also has tools for singing (which is speaking in the language of music) in every classroom experience. Need to sing along with a patriotic song history? Click on the Gynzy Jukebox. Need to sing Happy Birthday in your room to celebrate how special and unique each of your students are? 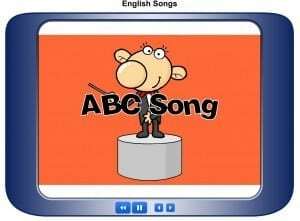 Or would you like to sing the ABC song together with your kids? Some of the tools has covered it for you with the Lyrics to Learn and English Songs tools. 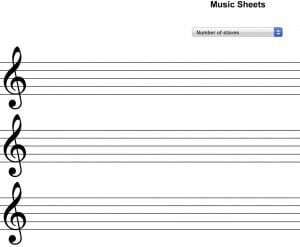 With so much emphasis by the National Association for Music Education on creating and expressing, the library of notes and rests are really going to be helpful. You can let students work on the interactive white board to write songs and rhythms easily without having to line the chalk board and don’t forget that you can write daily warm ups and include PDF’s of public domain music to keep ready for when they are needed in your own files on your desktop. You can share files with other teachers by copying the URL.